We have passed these days, users are no longer satisfied with slow starting computers, the computer should make a cold boot somewhere about 60-120 seconds with standard computer and rotating hard disk today. And this should not be a problem, if you just know how to troubleshoot it! 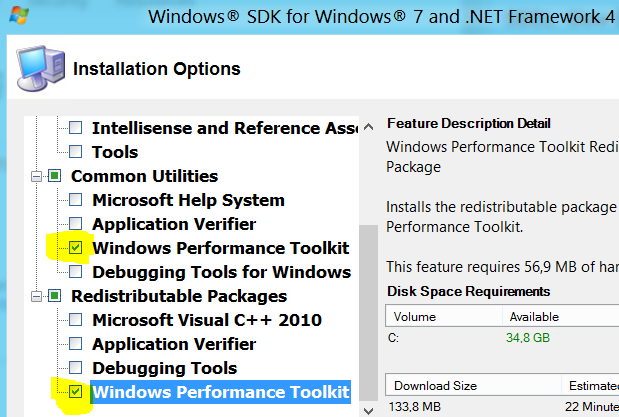 The number 1 tool to troubleshoot SBSL is xPerf in WPT (Windows Performance Toolkit), this can be found in Windows SDK. Ready to install? Just run the web installation, select Windows Performance Toolkit and in a moment you got it. Time to make your first trace? The computer will reboot and start the trace, make sure you logon rather quick all seconds will count. You can double click to open or open the xPerfView.exe in the WPT installation folder and locate the trace. I will not go thru the tool at this moment, but here is graphs for CPU, disk, interrupts, ReadyBoot, process lifetimes, services, boot phases. in this graph you can easy see how long it took for the different phases, and the computer is ready for the user at about 103 seconds. These transition phases is explained in a link further down. To get an idea where the problem could be, in this case GPClient take almost 30 seconds, which tells us the computer GPO’s is processing for a long time and should be investigated further. If you need any help with your troubleshooting, just contact me. Previous Previous post: Looking for a new smartphone?